With full fenders, Tektro Novela disc brakes, and lightweight aluminum butted frames, the Kona Coco makes for an excellent hybrid commuter bike. Kona has made some slight improvements on this bike, so the kinks have been worked out to make this a choice bike for urban dwellers. 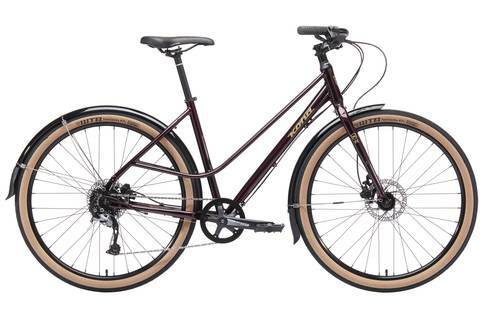 The geometry of the Kona Coco is especially convenient for riding around in any outfit, and the lightweight Mixte frame makes this women’s bike ideal for any commute. In addition to the comfy Kona Commuter saddle and full-length mudguards to protect from those puddles, the bike has a 1×9 drivetrain to keep things smooth and simple. With a decent price, this bike is worth a try for everyday use.